On the weekends, Jake and I have our cheat days where we have a bit more carbs and try new things! 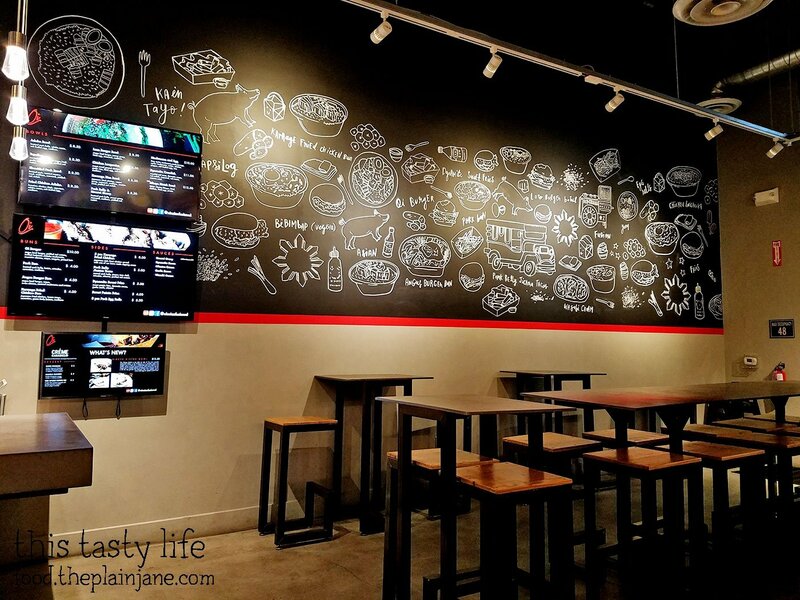 Recently we checked out a newer spot called Oi Asian Fusion. 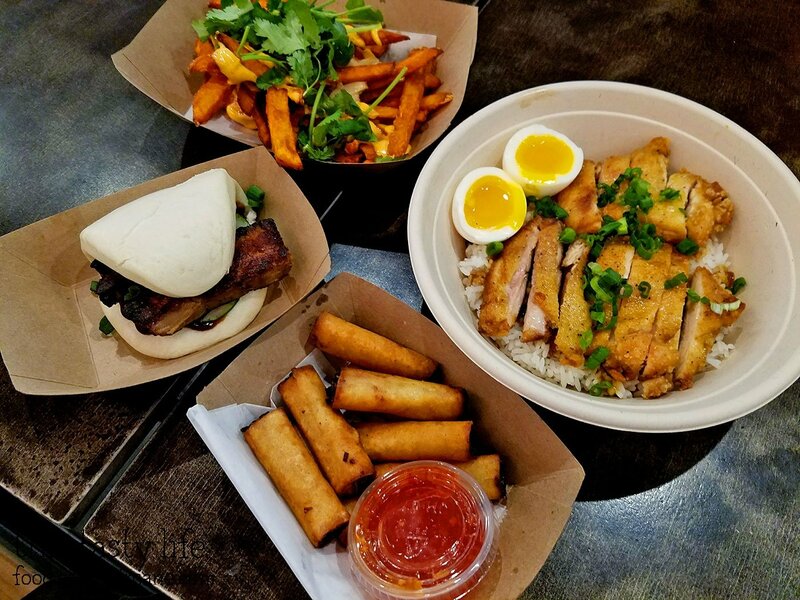 Oi Asian Fusion is located in MishMash’s old location in Barrio Logan (they moved!). Looks like they kept the furniture but just changed out the decor on the walls. 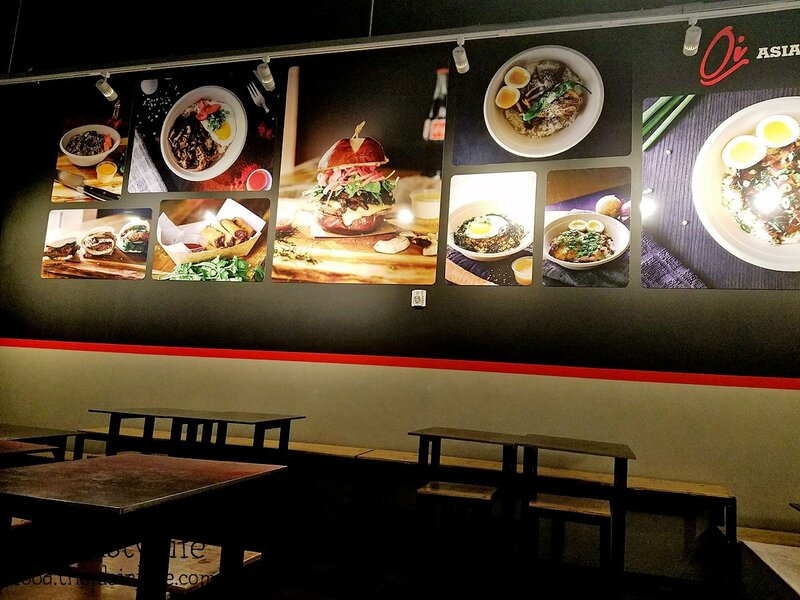 Oi Asian Fusion is a mix of Asian food with a heavy Filipino influence. 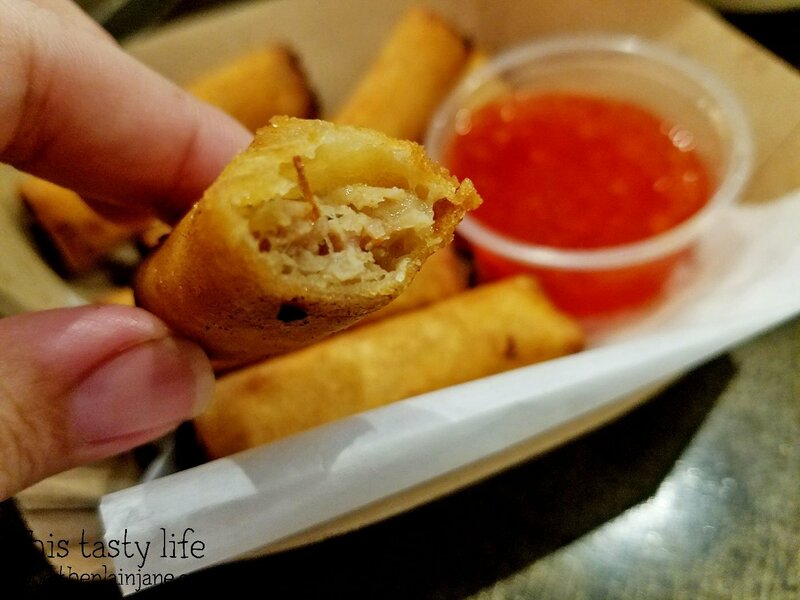 It amused me that their lumpia was listed as “pork egg rolls” on the menu. Probably so they didn’t have to explain what lumpia was all of the time. Jake and I got a few dishes to share between the two of us. What made me come here was seeing an Instagram post of that fried chicken adobo bowl! Mmmmm…. Fried Chicken Adobo [$8.50]…. 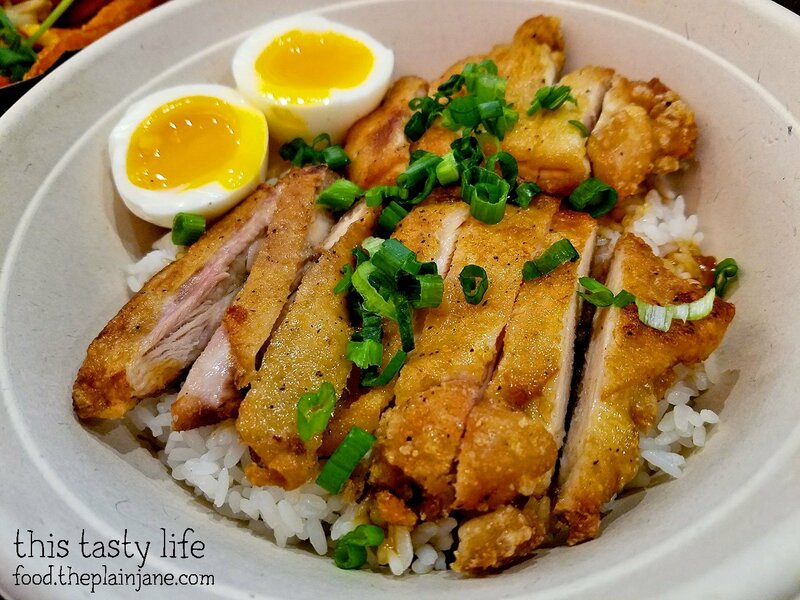 the bowl comes with rice, soft boiled eggs, scallions, and their signature adobo sauce. They use chicken thighs for the meat and it has a light crispy coating on the outside. I really loved this simple bowl of food. The chicken was tender and tasted amazing with the rice, sauce, and (dare I say it) the egg! Soft boiled eggs are okay in my book, weirdly enough! 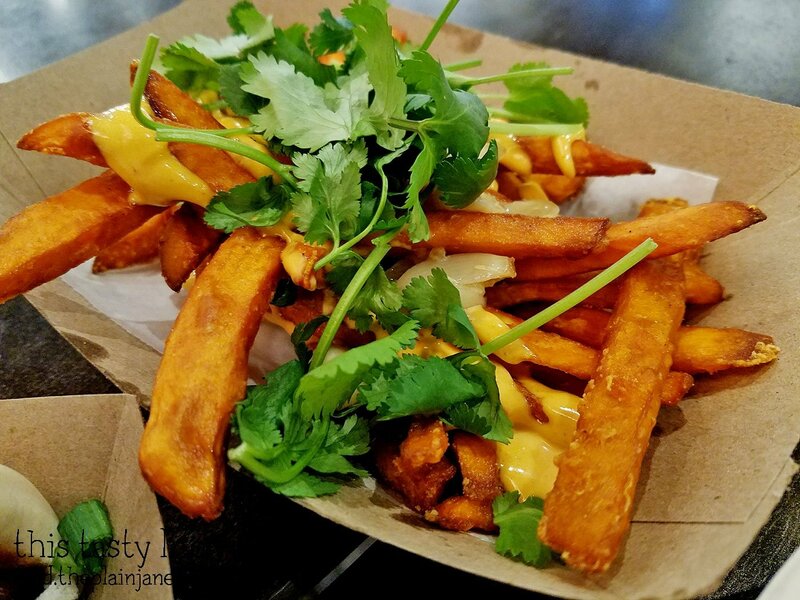 Jake wanted to try the Dynamite Fries [$5] which come with sweet potato fries, dynamite sauce, garlic confit, and cilantro. The garlic was tender and lovely and added hint of sweetness to the semi-spicy dynamite sauce. The sweet potato fries were a nice change from regular potato fries. They fries were super crispy with a light coating on the exterior of them with the perfect creamy texture inside. Yum! 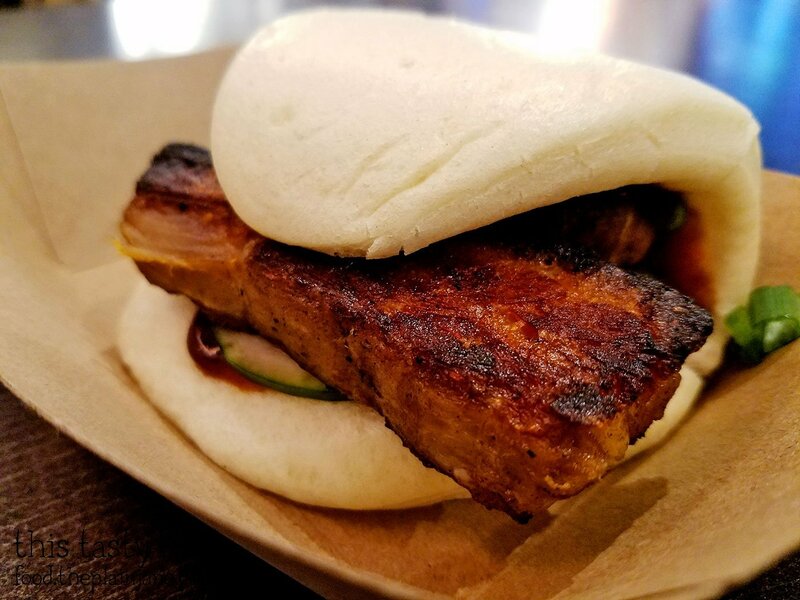 We had to try one of Oi Asian Fusion’s buns and we went for the Pork Bun [$4] with braised pork belly, hoisin, sriracha, cucumber, and scallions. The pork was pretty tender but I would have liked it to have a more crispy exterior. Also the hoisin sauce tasted very overpowering to me and drowned out the flavor of the pork a bit – maybe it was just too much sauce? Not sure there but this was just an okay bite for me. 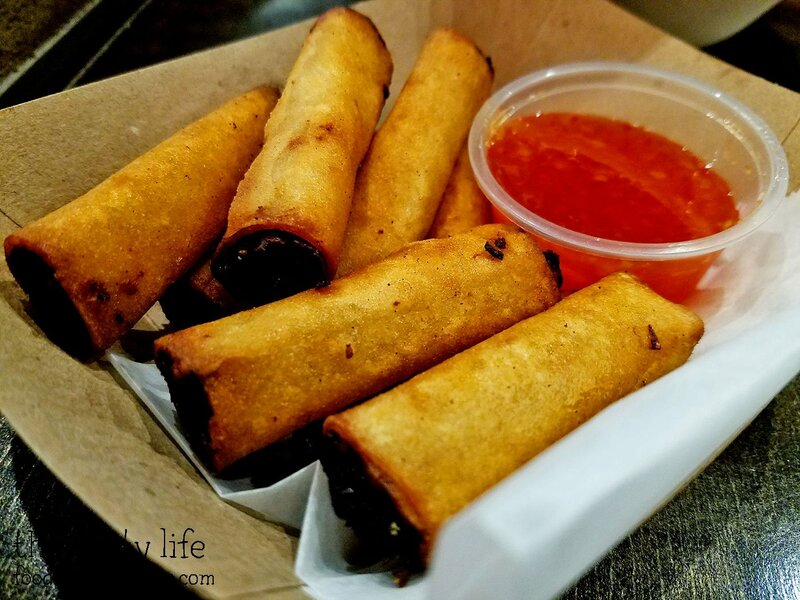 Of course I was going to check out the Pork egg rolls [$5] aka lumpia! These were of the short & stubby variety and served with a sweet chili sauce. It was pretty much an all pork filling with maybe a veggie or two in there somewhere. They were fried quite nicely and had a good flavor. Very crispy and yummy. My mom’s is the best, of course, but this is a pretty good “I didn’t have to spend hours rolling it myself” option. Would eat again! Overall we really enjoyed the food we tried at Oi Asian Fusion. 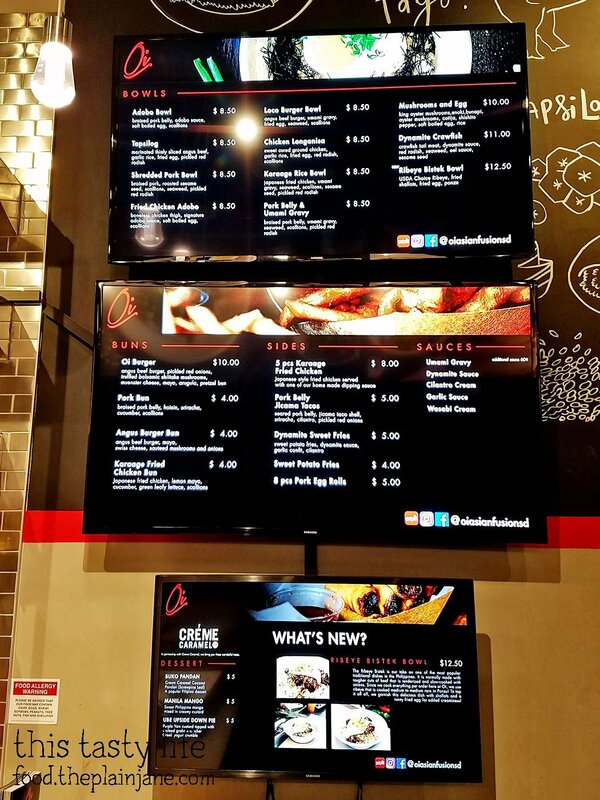 I can see myself popping back in to try some more items… or just eating that fried chicken adobo and lumpia again…. mmmmm. didn’t know that mish mash had moved! at first i thought you meant they had closed down! anyway, that Fried Chicken Adobo looks so good! price is right! we need to do another foodie meetup one of these days! I was confused when we first went, too, but I looked it up and happily Mish Mash is still around. Yeah, we do need to do another meetup! I dropped out of the group, are you still in it? We should pick a spot to meet up and try out! Good looking fried chicken adobo! Dark meat is my fav part of the chicken. Thanks, Soo, it was excellent! Dark meat is also my favorite part. White meat gets overcooked so often! I’ve been hearing about this place…curious to try it. There is another location in LA. Didn’t realize this was a chain. That fried chicken adobo bowl looked like chicken katsu. Not what I was thinking of when I see the words chicken adobo, but interesting twist none the less. Was here recently with CAB and we liked what we had (tocilog bowl, the mini lumpias and jicama pork belly tacos + two desserts. Hi CC – Yeah, it does look more like katsu than the adobo I’ve had in the past. But I still liked it! I want to go back and try some of the desserts! The jicama tacos looked really interesting too!